- trip computer (refer to the corresponding section). Warning messages (e.g. : "Emission control system faulty") or information messages (e.g. : "Boot open") may appear temporarily. Some can be cleared by pressing the " < ] arrow" button. press this button to abandon the operation in progress. Press the "OK" button to select the menu required. With the audio equipment switched on, once the "Radio-CD" menu has been selected you can activate or deactivate the functions linked with use of the radio (RDS, REG), the CD or the CD changer (introscan, shuffle, CD repeat). For more information on the "Radio-CD" application, refer to the "Audio equipment and telematics" section. Once the "Options" menu has been selected, you can start diagnostics of the status of the equipment (active, not active, faulty). - 12 or 24 hour mode. Once you have selected a setting, press the buttons to change its value. Press the buttons to switch respectively to the previous or next setting. Press the "OK" button to record the change and return to the normal display or press the " < ] arrow" button to cancel. Once the "Languages" menu has been selected, you can change the language used by the display. - fuel consumption (l/100 km, mpg or km/l). 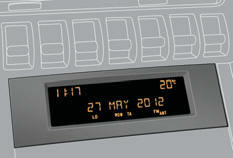 For safety reasons, configuration of the multifunction screen by the driver must only be done when stationary.